It started with fish tacos. A few months ago I was having lunch with one of our church’s college students over some delicious fish tacos from Fogata Mexicana in Rosemead (arguably the best fish tacos in the area). The student’s name is Arturo Flores, but a bunch of the youth staff and I affectionately call him “Churros” (like the delicious Mexican donut). 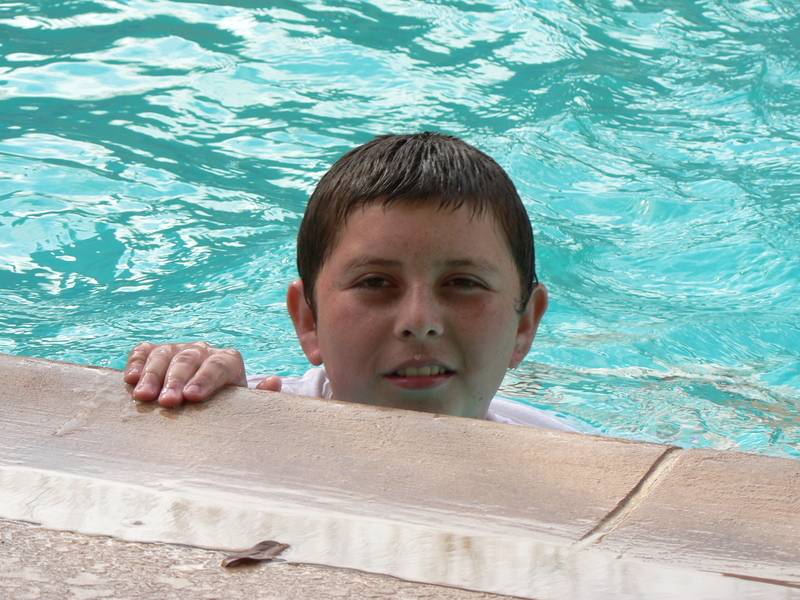 We first got introduced through our church’s old youth pastor, Kenny Moore, when Kenny began volunteering in the neighborhood sports program as way of loving the youth of Rosemead. Churros was one of the many Rosemead youth that came to our church during that time, and everyone at our church really took to him. He’s a really nice, funny, and promising guy. When he graduated high school, he made all of our youth staff at Evergreen really proud by pursuing his dream of art/design when he got accepted into Art Institute in North Hollywood. Churros now goes by the artist name “PotentOne.” He chose it because things that are potent are “small, but powerful.” Here is Churros in front of one of his displays at a small shop-gallery at ArtWalk LA this year. Churros came up with the idea of the Vine as we talked about what the gallery should be. We wanted it to be a place of growth for young artists in Rosemead… a place where they could showcase their work… a place to be recognized and encouraged… a place where they could receive resources and training. Our hope is that this will give these artists a hope for the future… and ultimately, that this gallery will uncover a hidden culture in Rosemead. It is my personal hope that this will change the city. Years from now, it would be amazing to see Rosemead have a vibrant art culture influenced by the lives of its residents… and that people would be able to identify the Vine as the gallery that sparked it all. My idea was to create a gallery at minimal cost, but with maximum creativity. 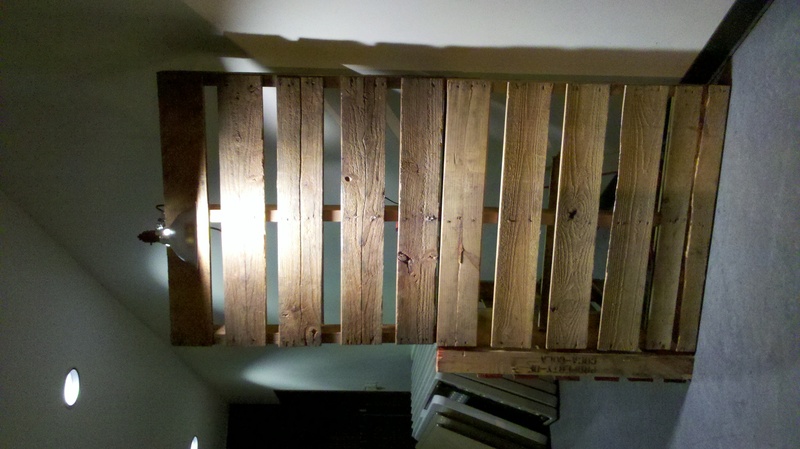 We don’t have a room with suitable wall space to put on a formal gallery for a lot of artists, so I had an idea to use wooden pallets to construct more wall space. 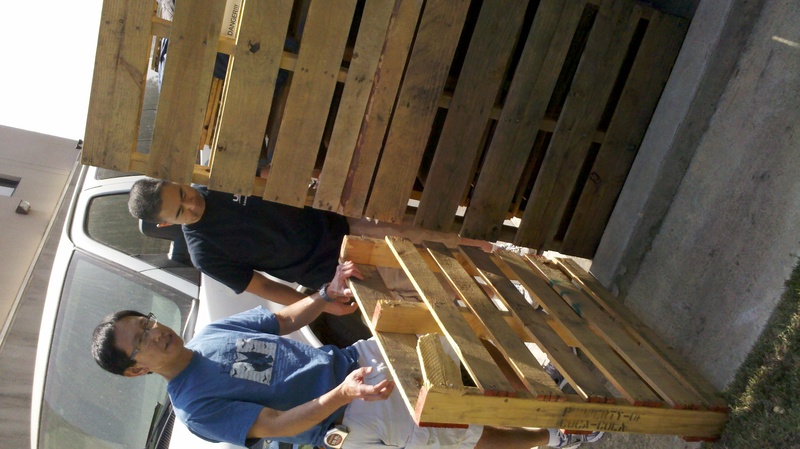 It’s economical (they’re relatively cheap), and they have a raw, rustic feel to them so we wouldn’t have to worry about damaging the pallets. In fact, the more banged up they look, the more character they get! 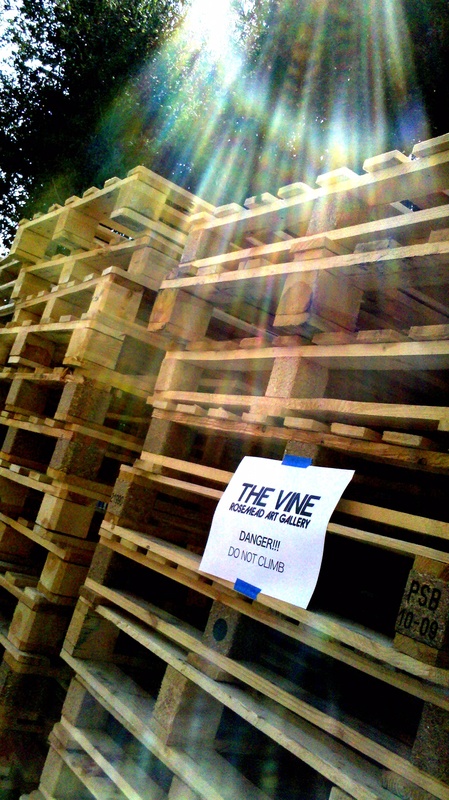 Pallets waiting to be used for art!! I asked Don Liv, a really cool artist at our church to partner with me (he had put on a few art shows in the past)… and with my limited background in museum production work, we set out to create the gallery! 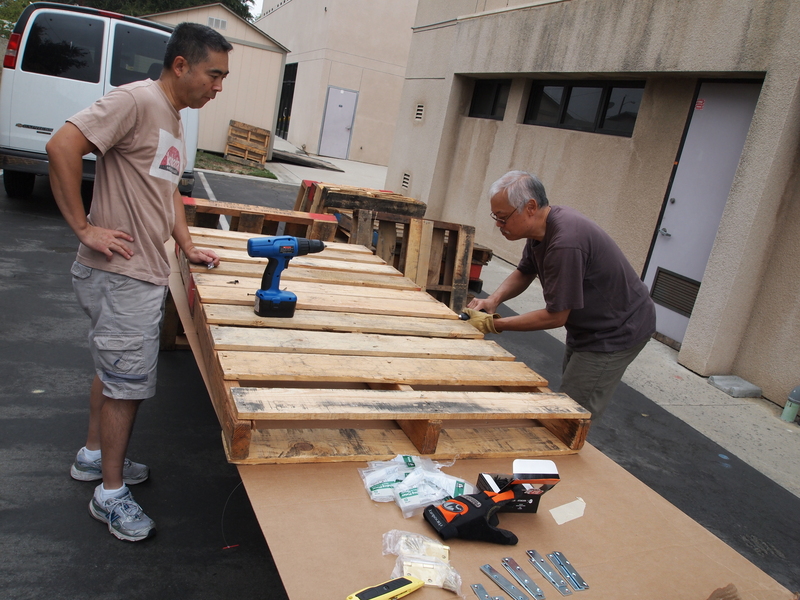 One of Don’s clients graciously donated 180 pallets to the church, and before we knew it… construction had begun!! 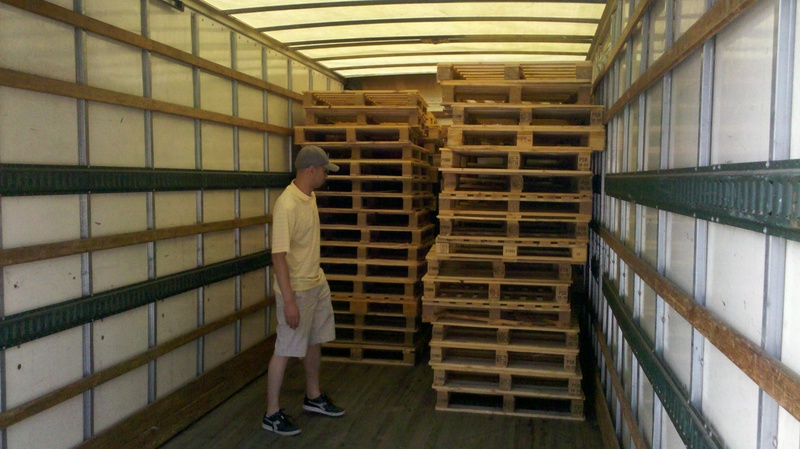 Don helping to load pallets. He’s been so instrumental in this gallery. I love his creativity and artistic sense! Don arranged the truck rental and the pallet donation! 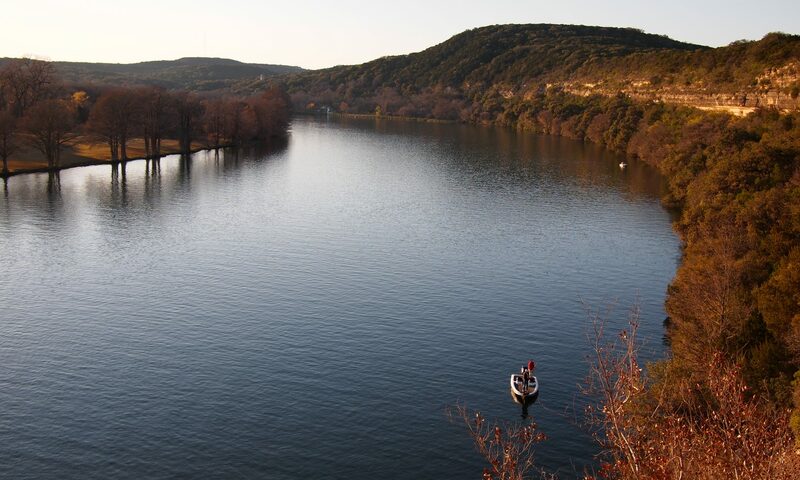 This is what I envision. At this point, nothing is secured… I had only arranged the pieces to show our builders what to aim for. Got some shop lights at Wal-mart to illuminate the artwork. We enlisted the help of some engineers and designers from our church, and with their wisdom and skills, we began designing and building the gallery walls! Dennis and Stuart. 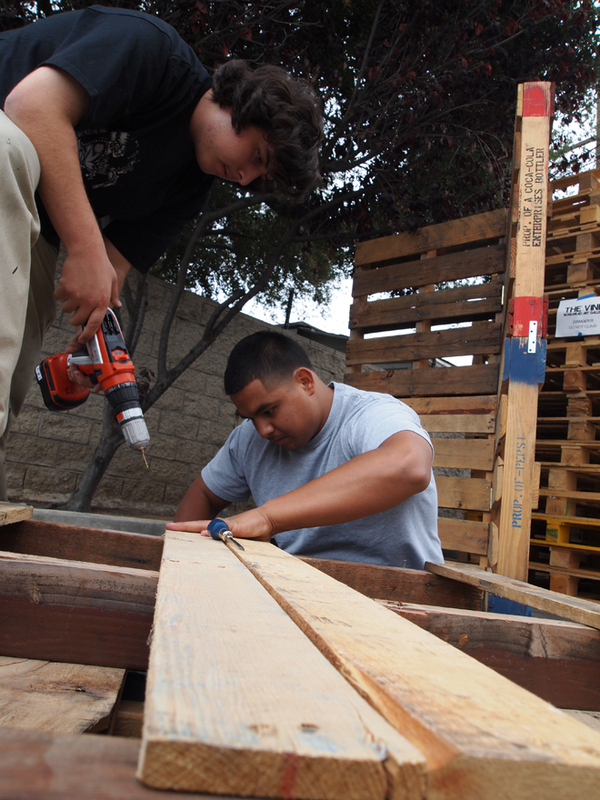 Two of our wise builders trying to figure out how to bring our pallet wall design to life! I totally love working with these guys! In the meantime, we have also been meeting with Churros and other artists from the area. Since the gallery’s purpose is to influence Rosemead, we wanted our first show to be about the city. 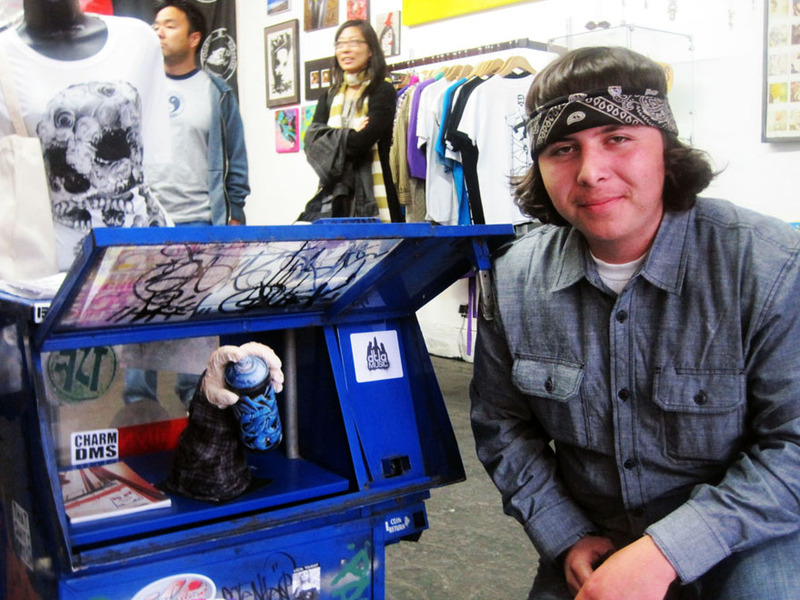 We came up with the theme: “A Dozen Roses: 12 artists inspired by the city of Rosemead”. Their mission is to go out and create pieces that reflect the city. It should be really interesting and cool… we have a bunch of graffiti artists, a few photographers, some sculptors, a video (or two), and a few designers. The opening showcase is on 10/8 at Evergreen, and it’s going to ROCK ROSEMEAD (I hope). haha. Stuart and Benne work on a gallery wall at church. They put the wall together in about half the time that it took the rest of us. They’re AMAZING. Churros and Luis (aka PotentOne and Squeeze), put together a gallery wall. Maybe I should come up with an art handle too. Do you think “Yellow Fever” is cool?? Second thought… I’ll just stick with “Jason Ashimoto”. Come out to our gallery opening! It’ll be fun for the whole family. We’ll have one of LA’s premier female DJ’s (DJ Mixtine) along with drawing lessons from USC sketching prof (Miller Fong)! Don’t miss this!! 10/8 at Evergreen from 4-9pm!! Help us change Rosemead!! Next PostNext A Dozen Roses.